This is one of my all-time FAVORITE movies! Excellent cast, settings, story, music – it’s the kind of movie I watch again and again and again and never cease to be inspired. As a ‘2-miler’ in high school track, I found the runners’ struggles and achievements to be extra motivational, but they are just as inspiring applied to the ‘race’ of life, faith and our daily challenges. This movie won a pile of Oscars in 1981, including Best Picture. If you have not seen this– it’s amazing. If you are interested to learn more of Eric Liddell, he died during WWII in a Japanese internment camp while serving as a missionary to China. 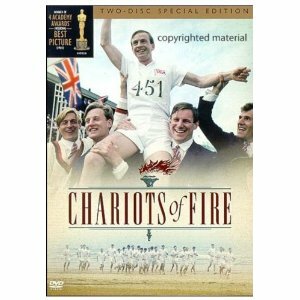 There’s an excellent biography by David McCasland entitled Eric Liddell: Pure Gold. During the Olympics in China a few years ago, NBC spotlighted Liddell as he is the only non-Chinese athletes to have a monument in his honor. This entry was posted in MOVIES !!. Bookmark the permalink. This is one of Eric’s favorite movies. He has actually used it for several sermons. I love the music!